A playful illustration incorporates the passions or pastimes that make them one-of-a-kind. Full of personality, this charming blanket lets a loved one know they're truly one-of-a-kind, with a playful illustration featuring the passion or pastime that makes them, well, them. Create your "character" by choosing a hobby, skin tone, hair color, and clothing, then give the charming keepsake to the person in your life who makes the world a more interesting place. Illustrated by Shelly Klein in Michigan. Woven in North Carolina. Printed in Alpharetta, Georgia. Check out the Personalized Family Hobby Art here. Machine wash gentle in warm water. Tumble dry low, gentle cycle. Do not wash with bleach. Do not iron. My daughter will use it at work to cover her lap. I'd like to update my 3 star review to 4 stars. I was immediately contacted by customer service who sent me a new blanket. They were very accommodating. I'm still not giving 5 stars as this material isn't really young kid friendly as it will snag based on the thread. But nice gift and great customer service! 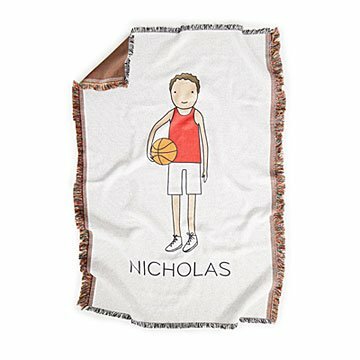 I loved the idea of this personalized throw. I bought 4 of them for my grandchildren. However won't purchase again because: 1) ordering more then one got complicated as you have to order and pay for them separately. I was on the phone and emailing this company for a couple days to get my orders straighted out as changes were needed. They were certainly pleasant to work with so I have no complaint about how they treated me. Just a comberson process. 2) this product is way overpriced for what you get. Fabric is flimsy and snags easily. In fact one of my throws arrived with a snag but I couldn't bear dealing with a return as ordering was such a pain. Also not really a snuggle blanket as i had hoped as it's actually a little scratchy. Best used as a conversation piece.